Happy Memorial Day! Remember, we are the home of the free, because of the brave. All fallen soldiers have my utmost respect and gratitude. Today was a relaxing Monday, spent with my fiancée, who just returned from the Indianapolis 500. My stomach has been so angry, so today, I heavily relied on Digize. That oil makes my tummy so happy, and as someone with all sorts of tummy issues, this is greatly appreciated. It made my day so much more bearable, but made me recognize how badly I needed to get back on clean eating. Andrew had practice and during that, I got my affairs in order for Whole 30! 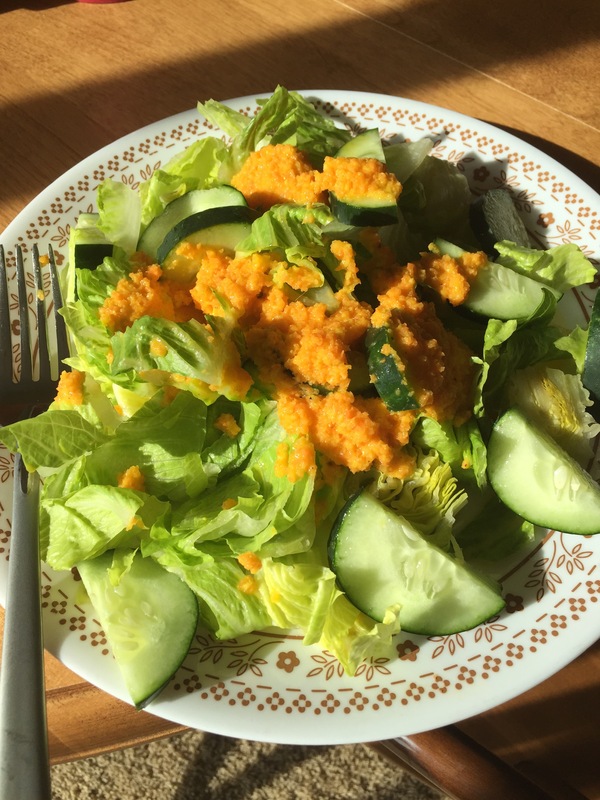 I made a Zesty Ginger Dressing from Wel Fed 2 (amaze balls). It tastes just like the one I adore at sushi restaurants, and man, where has this been all my life! Then I made Paleo Mayo from Well Fed 1/2. These are the sauces that will keep my food yummy all week. Paleo Mayo is so versatile and so, so yummy. 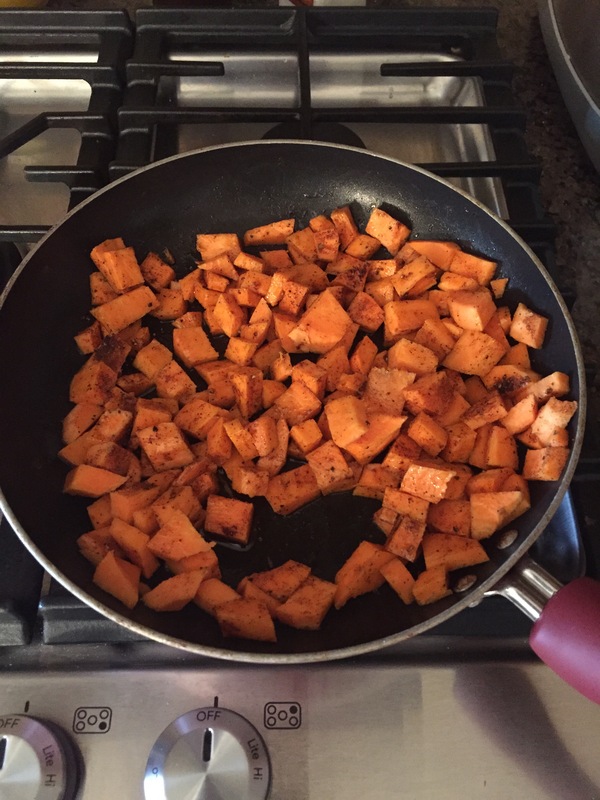 I also stir fried some sweet potatoes for breakfast tomorrow. 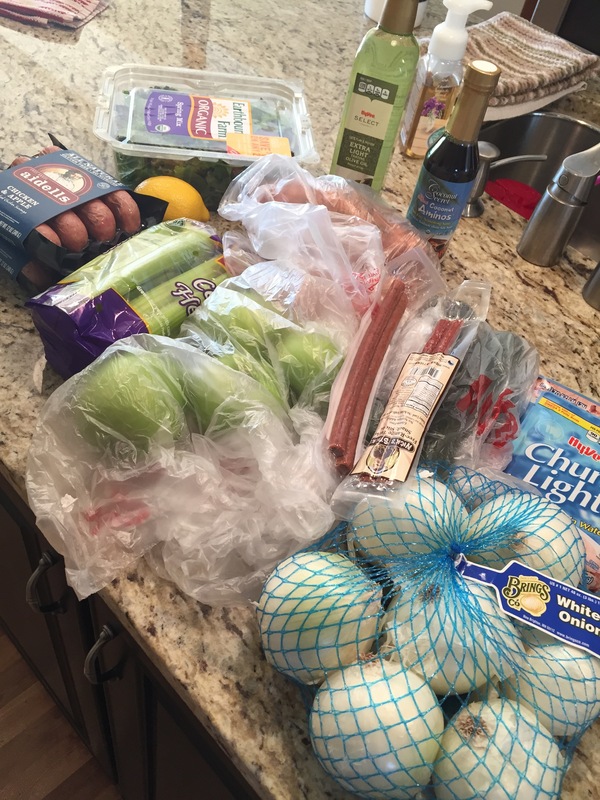 I plan on also frying some eggs and having two Aidell’s Chicken Apple Sausage. For lunch I will have the above salad, with hard boiled eggs. For Dinner, I may try to make Melissa’s Chicken Hash from the Whole 30 cookbook! I’m really excited to do a whole30 with my new workout regimen! I’m ready to be a strong, beautiful, bride! Today’s workout was all shoulders and we finished with push-ups. By the end, I was shaking so badly, and so sore! So, naturally, Deep Relief was a necessity! That oil is all sorts of minty goodness and I love that it rolls on cold and gets warm. It works serious magic and gets so deep! Love my essential oil journey! Stay tuned for more Whole30 and oil adventures! Please comment, or leave me a message, or email me at kelsilee@gmail.com. Memorial Day Oil Special! Follow me on Instagram @youngwholeessential and I will a) gift you the Essential Oil Pocket Reference App (iPhone or iPad) b) give you $20 via PayPal and c) you get the Happy Oils Handbook, a magazine that has recipes, oil ideas and other fun things! Offer is good for the next person only!